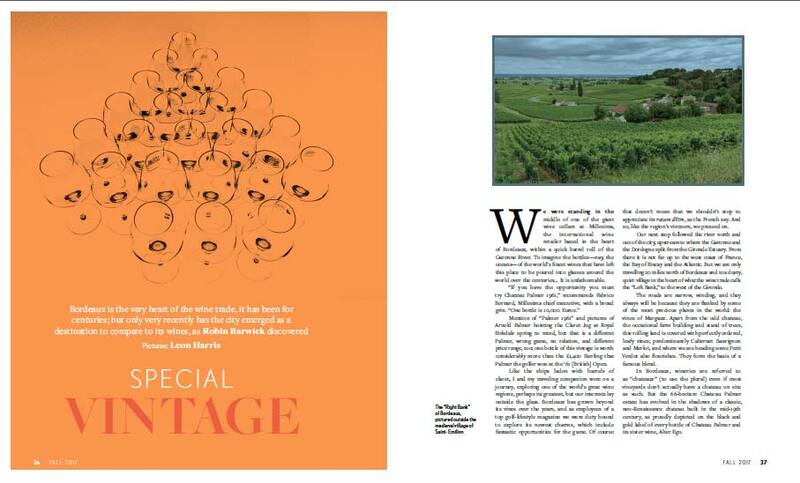 The exclusive Arnold Palmer magazine, Kingdom, has featured Greens & Grapes and golf holidays in Bordeaux in its autumn issue. 1961 was a good year for wine. This was especially true for Chateau Palmer, the Margaux estate whose 1961 red now retails for an extraordinary €10,000 a bottle. 1961 was also a good year for golf. That was the year one of our heroes, Arnold Palmer, won at Royal Birkdale to claim his first British Open. This ‘Palmer parallel’ is raised in the autumn edition of Kingdom, the exclusive golf magazine started by Arnold Palmer. Robin Barwick, the managing editor of Kingdom, visited Bordeaux earlier this year to see first-hand why we love playing golf here. It gave us the chance to chat about all the reasons Bordeaux is such a great place to play golf. We also spoke about the fabulous ‘added extras’ like wine tours and gastronomical treats. The magazine is well worth checking out for the well-crafted words, as well as some magical photographs that showcase the Bordeaux region in all its glory. You can read Kingdom magazine’s article on golf in Bordeaux here. Browse our range of golf holiday options in Bordeaux and south-west France.